Saturday 21st September saw one of the highlights of the Salford Cultural calendar arrive with this years’ ‘Taste of Salford’ event, giving the city of Salford a great day to celebrate the food culture of the region, as well as celebrating everything else that makes Salford such a great place to live. The Civic Centre lawns in Swinton were decked out for a foodtastic day of tempting treats to tickle the tastebuds, with a range of fun activities for youngsters including facepainting and a climbing wall, with an array of stalls selling a tempting assortment of local produce. The Foundation team were also in strong attendance, and not only to indulge in the wide selection of tasty morsels on display... Danny Barton! While admittedly a significant time was spent sampling the various treat, our outreach team were also there to promote our range of health, education and social inclusion initiatives, utilising Rugby League and the Salford Red Devils as a vehicle for inspiring positive change within the Salford community. Through both the Salford Red Devils Foundation gazebo and information point, as well as speaking to event attendees, the team had the opportunity to promote current and upcoming Tackle Unemployment, Septembers’ Stoptober activity and our wide range of Social Inclusion and community sports projects. 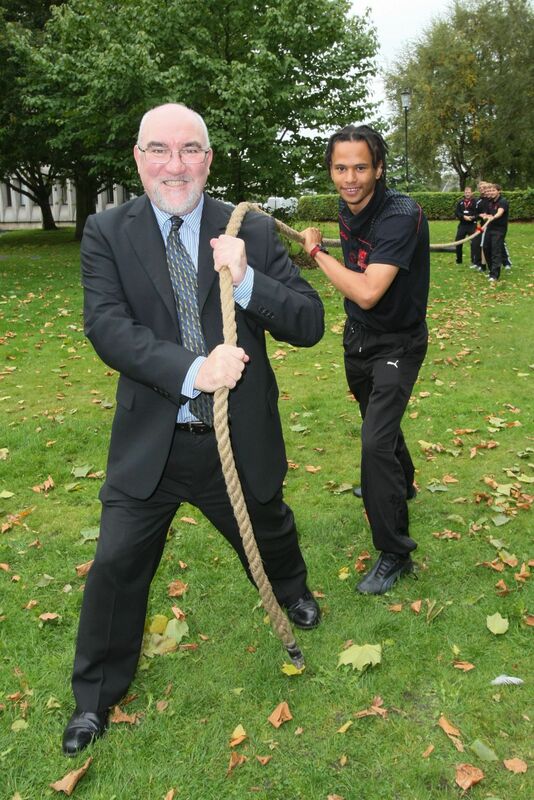 Through a range of Rugby based skills sessions and the ever popular tug-of-war rope, the team had the opportunity to speak to youngsters at the event to promote healthy lifestyles and the role rugby and team sport can play in supporting a healthy, active and happy lifestyle, while also discussing the Foundation’s progress with city dignitaries and event organisers. Foundation Manager, Mark Brocklehurst said, “We really enjoy attending these kind of cultural events in the Salford, and it’s fantastic to see the area so engaged with local culture and the regions food producers. “Today gave us an opportunity not only to celebrate the regions breadth of food culture and production but also the opportunity to discuss the foundations own activities with a section of the city who perhaps don’t make it down to the stadium to watch games very often.